A course towards the West end of the Costa del Sol – but short of the bunch of premier courses near Gibraltar. This course is definitely not expensive. I describe it as lower end of the mid-priced bracket of the courses out here. Close by the club is the port of Duquesa – actually quite a small marina not a big port like others nearby. Duquesa is not really a high-end business/living center. I do not mean it is sparsely populated. On the contrary, the course is surrounded by lots of mid-sized apartment blocks. Some are obviously failing as a business proposition (following the Spanish property boom/bust) but overall there is enough contented occupation of property to make the surrounds of the course pleasant. The clubhouse and immediate surrounds are quite large and open-plan, although a bit faded in colour and fittings. The whole club is very close to the A7 (N340) main road, so the Mediterranean sea is very near and the sea views are attractive. This is quite a tough course, particularly for one that is definitely lower-priced. There are strong plastic hole maps on each tee box. Nice that they have some distance measures on them. Not so nice that they show every hole as dead straight, which obviously they are not. All holes have fairways with strong slope (left/right across the fairway). The first 9 holes are more up-and-down with narrow fairways, the second 9 a bit flatter and more open fairways. The first 9 have tough, wild rough. By that I mean extremely dense natural bushes and vegetation alongside fairways. Your golf ball can be on the fairway 1 meter away from the rough and absolutely fine. Or your golf ball can be 1 meter into the rough and completely unfindable in dense brambles and heavy green bushes. 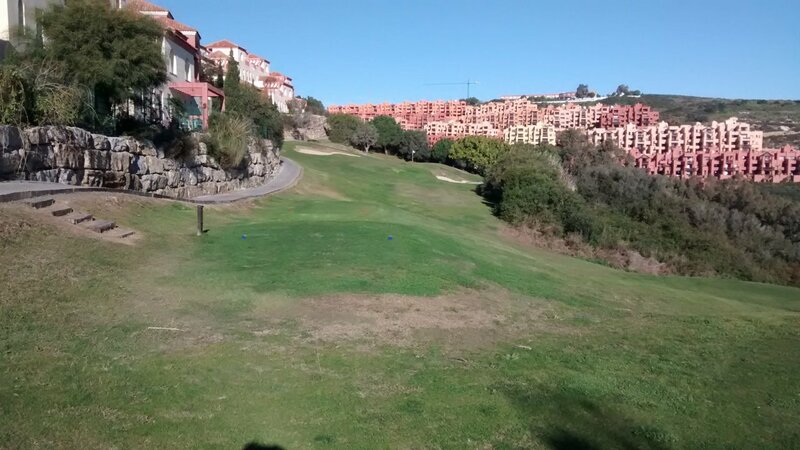 Distinctive compared to other courses on the Costa del Sol where every square meter of the entire course they manage the vegetation to some degree. On the second 9 holes the rough is much less formidable and errant shots much less punished. 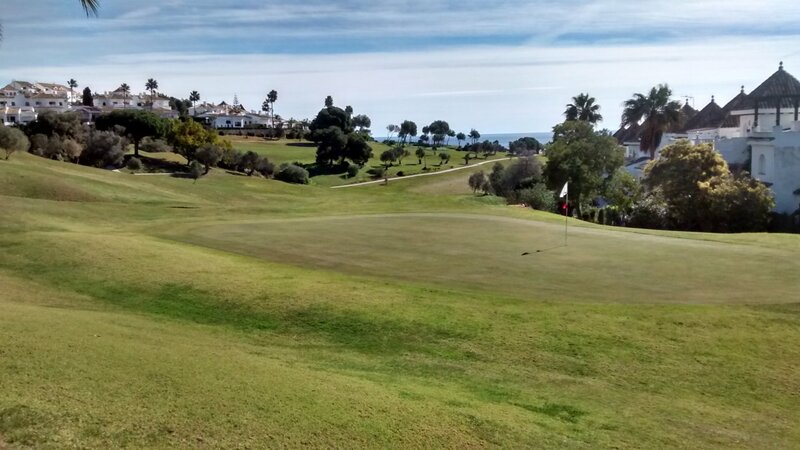 Greens on the whole course are good – the best feature of the La Duquesa golf course. They are smooth, nicely grassed and fast. They are often sloped or domed and frequently kidney-shaped, with narrow width (left-to-right across the green as you approach it) but deep (longer back-to-front along the green). This means they can hide the flag at the back of the green where the direct line to the hole offers very little green to aim for. So the greens although generally high quality are definitely not easy. Not many bunkers, mostly around the greens. The bunkers are not set down in the ground much (they have small bunker lips) and have hard-packed sand. In some cases it might be wiser to putt out of them than get a flyer of a golf ball out of the bunker because you can not get the sand wedge under the ball. The fairways are the area that I think make the golf here unpredictable. Wide array of types of grass, growing at different rates. The fairway grass is simply not up to the standard that most regular golfers would expect. I personally would never play this golf course – at any time of the year – unless I could pick up the ball on the fairway, clean it and replace it on a nearby decent patch of grass. I do not like 'lottery golf' and playing every ball on the fairway where it lands is a complete lottery at La Duquesa. I think La Duquesa is reasonable value-for-money at quite a low price. High-handicap players should really just punt the ball conservatively along the fairway all the way up to the green. This is too wild and tough a course for them to take any risks before getting to the green. And once they get close to the green, accept that getting close to the hole on an approach shot is a tough target – just 'hitting any part of the green' is a good result. Mid-handicap players will have to hope they are really accurate on the day off the tee and fairway. If you play fairly optimistic 'go-for-it' golf here, the course can suddenly give you a bad roll or lie that trashes your score on that hole. Low-handicap players who know the course well, and can work their way out of trouble from some random results, could score well because the course is not particularly long. In conclusion, La Duquesa was certainly not designed to be easy in the first place. Fair enough – they wanted to make you think going round it. But the current condition of the course adds an extra layer of toughness that IMHO pushes it to a level of difficulty that the original design never anticipated. So definitely an acquired taste - maybe I need to play this course a few more times to learn it's subtleties. As things stand now, I do not really know which level of golfer to recommend this course to. It feels like quite an old course that has now been passed by - by other courses set up and run more progressively as golf on the Costa del Sol has evolved to target specific types of golfers. 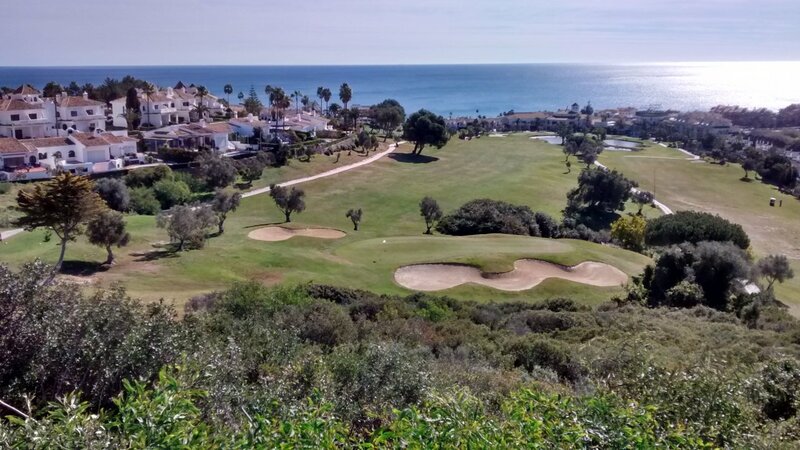 Very few regular golfers I know down here on the Costa del Sol (spending on average about €2000 every year on their golf) ever visit La Duquesa. If you are prepared to spend a little bit more money (only €15 – €20 more per round) then there are other courses not far from La Duquesa that in my opinion are well worth the extra expense. Of course every golf course is a matter of personal taste. La Duquesa is a friendly place with helpful staff. If you enjoy playing here, then you can probably get an excellent deal to play it several times at very low cost. Final word: The buggy paths at La Duquesa are also pretty wild – drive carefully !. La Duquesa is the yellow dot. Basically shows the course is average length and slightly less than average difficulty compared to other courses on the Costa del Sol. An 18-handicap player can expect to play this course at 19 over par. IMHO this 'official' difficulty rating understates the real difficulty of the course - due to it's condition rather than design.